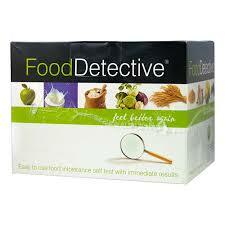 has areas spotted with food protein extracts. A small blood sample is taken from a finger-prick and is then diluted and added to the tray. In subsequent steps the use of detector and developer solutions identify the presence of food antibodies through the appearance of one or more blue spots on the tray. Reference to the food layout plan enclosed within the instructions allows you to identify any foods to which the patient may have an intolerance. Simple, safe, accurate and fast, Food Detective™ is the world’s first in-clinic test for food intolerance. You could be intolerant to certain food … find out, test today! Although not life threatening, food intolerance should never be underestimated as its impact on sufferers can be significant, sometimes affecting their ability to live normal healthy lives. The incidence of food intolerance is extremely wide and it is estimated that 45% of the population could be affected. Many people with food intolerance experience more than one symptom. Symptoms can often be vague and the root cause of the problem, food, is not always correctly diagnosed. Sufferers often complain of seeming to be in a ‘fog’, feeling bloated and being tired all the time. Essentially food intolerance is your body’s abnormal reaction to certain Foods which can manifest itself in a number of ways. Some people will have one symptom such as a severe headache whilst others will be unfortunate to experience irritable bowel syndrome, migraine and skin or respiratory conditions. Realising that your food is a catalyst for particular symptoms is not easy when, unlike the immediate reactive symptoms of food allergy, food intolerance symptoms often appear hours or even days later. In fact many food intolerance sufferers have commented post diagnosis and after having removed their problem foods that they realise they had been experiencing minor symptoms as a result of intolerance for their entire lives. Food allergy is not the same as food intolerance. A common confusion generally exists whenever the words food allergy or food intolerance enter a sentence. A classical food allergy (such as peanut or shellfish allergy) is usually characterised by an immediate and often severe reaction of the immune system to exposure to a specific food. The symptoms of food allergy include sneezing, rashes, skin irritation, swelling, runny nose, fatigue, diarrhoea and vomiting. Normally symptoms occur within a few minutes of eating or coming in to contact with the offending food, although they can be delayed by up to two hours. Food allergy is quite rare with only about 2.5% of the population being diagnosed with the condition. The most common instances of food allergy are to peanuts, tree nuts (almonds and brazils), eggs, milk, fish and shellfish. If you have any of the following symptoms they could be suffering from food intolerance. If the Food Detective™ test shows any positive reactions, it means that the patient has an elevated antibody reaction to that particular food indicating their body’s intolerance to it. Reactions can be mild, moderate or strong. Once you are aware that they have food intolerances it is advisable to eliminate any ‘reactive’ foods from their diet for at least 3 months. The thought of cutting out certain kinds of food from their diet (possibly some of the favourite food) can be daunting at first. Some people can often feel worse for a few days when they eliminate a food and although certain foods can be difficult to give up, they need to persevere. When removing foods from their diet they must try and replace those foods with substitutes. There are often more alternatives than you think.